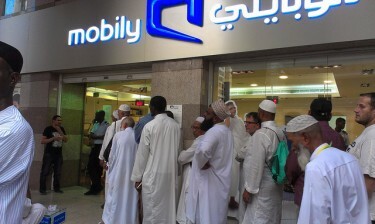 Saudi Arabia's second largest telecommunication company, Mobily, has reached out to a privacy advocate for help in surveilling encrypted communication applications. In March, the governmental Saudi Communications and Information Technology Commission threatened to block WhatsApp, Skype and other applications that do not comply with Saudi regulations (which include allowing surveillance) and gave telecommunication companies a deadline to find a solution or block them. The American developer and privacy advocate Moxie Marlinspike published an email exchange that he had with Mobily as they were looking for help. If you are not interested than maybe you are on indirectly helping those who curb the freedom with their brutal activities. @moxie: Thanks for all of the kind words and encouragement from Saudi Arabia. When they try to silence you, be loud. @FarisAbaalkhail: The solution is not to only change the service provider if [this] is proven to be true, but to demand laws that protect our privacy and criminalize such actions. @ZajeelBird: #Mobily Spies on the People – for that they should be punished and those who ordered them should be punished too, namely the Interior Ministry.